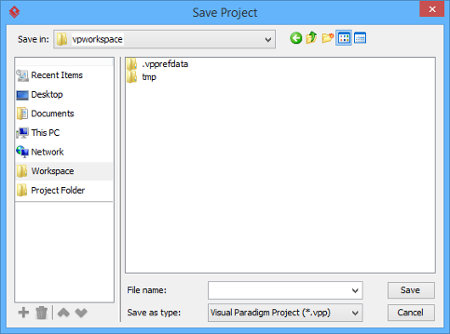 Visual Paradigm saves all project content to a single file, with file extension .vpp. To save your work, select either Project > Save or Project > Save as… When you are saving a project for the first time, you will be asked to specify its location. If you have connected to VPository/VP Teamwork Server, you can directly import your project to the server now. Otherwise, you can save the file to a local directory.